For the past few weeks (or perhaps months), you've wondered countless times just how you would pop that all important question. You know exactly what you want to say, but want to ensure that the words are ''proposal perfect . No worries! This stunning diamond ring will express everything that words cannot. Ask for your sweetheart's hand beneath the evening sky and give the stars some serious competition. Equally as bright and beautiful, this gorgeous diamond ring will be met with an ecstatic reaction when you slide it on your darling's finger. 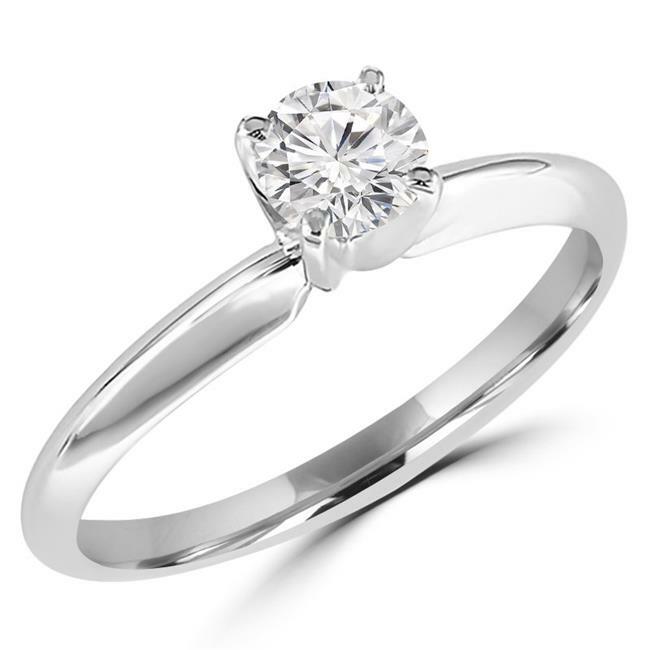 Imagine how dazzling the diamond will look in the moonlight and how captivated your partner will be by its brilliance. You'll be one step closer to happily ever after (with or without the words you've been rehearsing). This 0.41 CT Round Diamond Solitaire Engagement Ring features a mesmerizing round cut diamond at the center of a lustrous 14K white gold band. The diamond has a G-H color range and SI2-I1 clarity. This is a ring that is sure to be cherished.